View More In Faucet Handles. 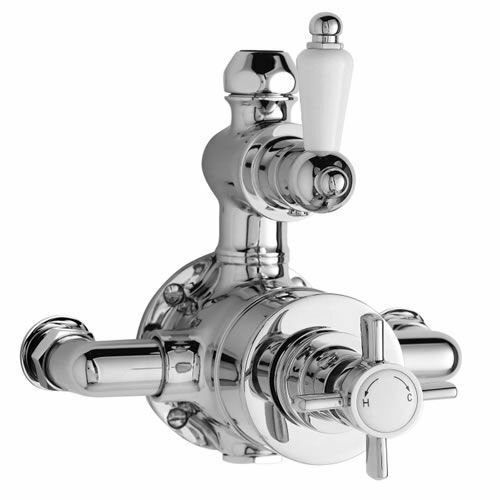 The Chrome Twin Exposed Thermostatic Shower Valve enhances the appearance of any traditional-style bathroom. The exposed shower valve features ceramic and chrome materials for the tap and control lever, which regulate the temperature and the rate of flow of water through a fixed shower head or rigid riser kit. Please note: Valve Inlet connections are ½"
Fitted with 1/4 turn ceramic disc technology for ease of use and durability. Recommended pressure for best performance 2 - 75 psi. 1/2" Inlet Connections Compatible with standard US plumbing connections. Built in anti-scald device Factory pre-set temperature (104f).